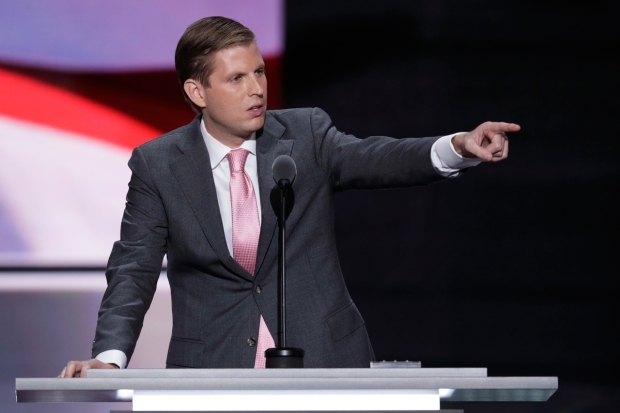 As the Republicans met for the third day of their national convention, it was Eric Trump’s turn to take the stage — following appearances by his brother and sister, Donald Trump Jr. and Tiffany Trump. 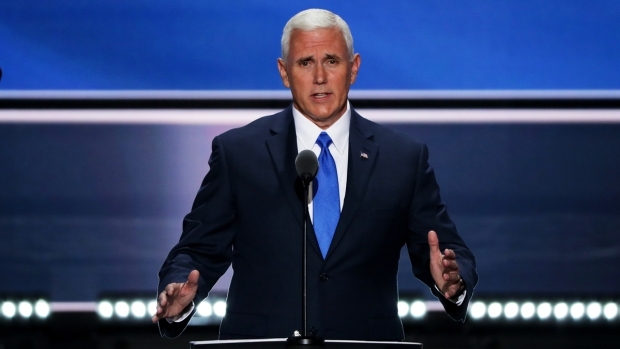 Donald Trump’s vice presidential pick, Indiana Gov. Mike Pence, introduced himself to the gathering, and one of Trump’s harshest critics in the bitterly fought primaries, U.S. Sen. Ted Cruz, got booed. Here are some top moments from Cleveland. Texas Sen. Ted Cruz was booed from the floor as he refused to endorse the party's nominee, Donald Trump, telling the convention instead, "If you love our country and love your children as much as I know that you do, stand and speak and vote your conscience, vote for candidates up and down the ticket who you trust to defend our freedom and to be faithful to the Constitution." Trump's family sat motionless as Cruz spoke and the audience turned against him. Cruz, who was bested by Trump during a nasty primary, mentioned his former rival only at the beginning when he congratulated him on winning the nomination. He focused on what Republicans believe and especially freedom, at first earning cheers. "We have no king or queen," he said. "We have no dictator. We the people constrain government." America is exceptional, he said, because it was built on what he called the most beautiful and powerful words in the English language: "I want to be free." Citizens are furious at a political establishment that cynically breaks its promises and ignores the will of the people, he said. "We have to do better," he said. Toward the end of his speech -- as he spoke over the restive audience and at one point said, “I appreciate the enthusiasm of the New York delegation" -- Donald Trump walked into the arena in preparation for his son Eric's appearance. 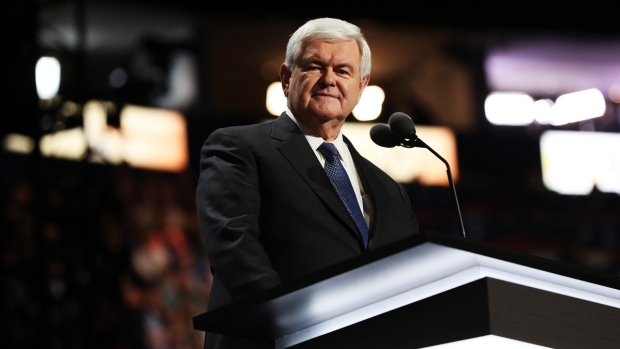 Newt Gingrich spoke at the convention just after Sen. Ted Cruz was essentially booed off the stage when he failed to endorse Trump. Gingrich attempted to smooth things over. A low-key governor to balance the showman at the top of the ticket, Mike Pence accepted the nomination for vice president and told the crowd he had been raised in a small town in southern Indiana "on the front row of the American dream." His political heroes were President John F. Kennedy and the Rev. Martin Luther King Jr., he said. Mike Pence introduced himself after accepting the nomination for vice president at the RNC in Cleveland. He noted Donald Trump's big personality and joked that with his quieter personality, they'd make a good team. "I guess he was just looking for some balance on the ticket," Pence joked of Trump. "Growing up I actually started in politics in the other party, until I heard the voice and the ideals of the 40th president, and I signed on for the Reagan Revolution," he said. Pence described Trump as a man who never quits, never backs down, a fighter and a winner. The Republican ticket would win, he said, because the American people were tired of watching "a mountain range of debt" build up, tired of being told "this is as good as it gets" and quoting Ronald Reagan, "tired of being told that a 'little intellectual elite in a far-distant capital can plan our lives better for us than we can plan them for ourselves.'" Clinton, whom he called the "secretary of the status quo," represents a third term of President Barack Obama, he said. She champions Obamacare, which she all but invented, more taxes and more government, he said. Indiana has a $2 billion surplus and nearly 150,000 net new jobs, he said. And following a theme set by earlier speakers, he acknowledged Trump's sharp edges. "Donald Trump gets it," he said. "He's the genuine article. He's a doer in a game usually reserved for talkers. And when Donald Trump does his talking, he doesn't tiptoe around the thousand new rules of political correctness. He's his own man, distinctly American." Eric Trump endorsed his father as the one candidate who did not need the job, the one who could not be bought, the one who was running for the right reasons. "It's time for a president with common sense," he said. "It's time for a president who understands the art of the deal." After Donald Trump’s wife, Melania, son Donald. Jr., and daughter Tiffany spoke at the previous nights of the RNC, his son Eric spoke on the third night. He praised his father's business successes. Trump was running for the laborer forced out of a job because of illegal immigrants, the oil and gas worker denied a job because of what he called the radical Environmental Protection Agency, for single mothers and middle-class families, he said. "It's time for a president who can make America great again, ahead of budget and ahead of schedule too," he said. Clashes broke out outside the Quicken Loans Arena when members of the Revolutionary Communist Party set an American flag on fire to protest what they called the crimes of the American empire. 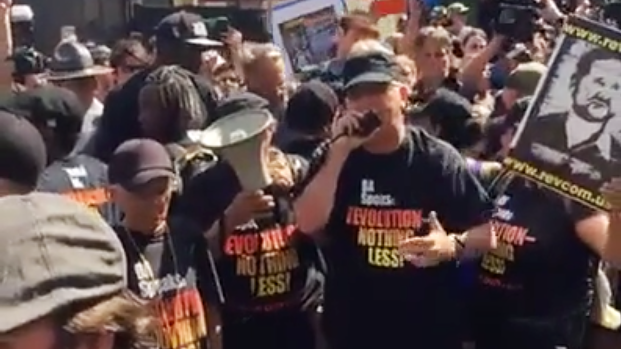 Leading the protesters was Joey Gregory Johnson, whose similar flag-burning at the Republican National Convention in Dallas in 1982 was ruled protected speech by the U.S. Supreme Court. On Wednesday, he was thrown to the ground by several police officers. 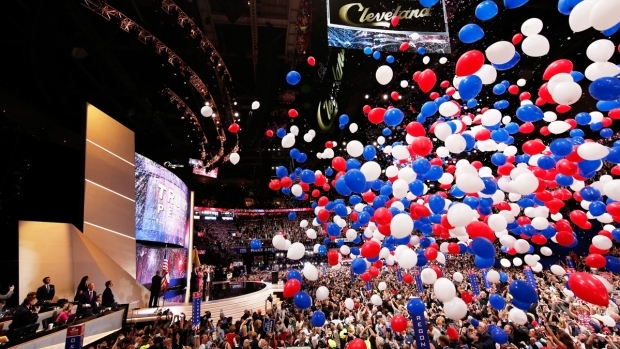 Anti-Trump protesters burned an American flag and were arrested outside the Republican National Convention in Cleveland, Ohio on Wednesday, July 20, 2016. 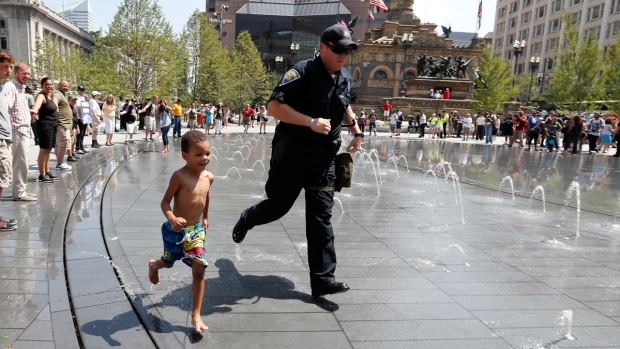 Eighteen demonstrators were arrested and two police officers received minor injuries, according to Cleveland officials. As Trump supporters waved American flags, officers on bicycles and horses cleared the streets. Police Chief Calvin Williams was out with his officers and he promised to show up whenever there were problems. Free speech was on display in Public Square just blocks from the Republican National Convention. The park became a gathering place where people amplified their cause. Here, members of Turning Point USA denounced big government. The founder said they are a nonpartisan group. A Trump adviser called for Hillary Clinton to be tried for treason and executed by firing squad if convicted for her use of a private email server while she was secretary of state. "As far as I'm concerned, the laws of the land on treason could be firing squad if she's found guilty," Republican New Hampshire State Sen. Al Baldasaro told NBC News, standing by comments he had made earlier. The threat of death was just the latest made against the presumptive Democratic nominee. Earlier in the week, Michael Folk, a Republican in the West Virginia House of Delegates, tweeted "@Hillary Clinton You should be tried for treason, murder, and crimes against the US Constitution …then hung on the mall in Washington, D.C." Folk, who was suspended from his job as a pilot with United Airlines, later said he regretted saying Clinton should be hung but still thought she should be tried. Tuesday night, during a speech by New Jersey Gov. Chris Christie, the crowd started chanting, "Lock her up." Trump's spokeswoman Hope Hicks said of Baldasaro's comment: "No, of course Mr. Trump does not feel this way." Emilie Plesset contributed to this report.